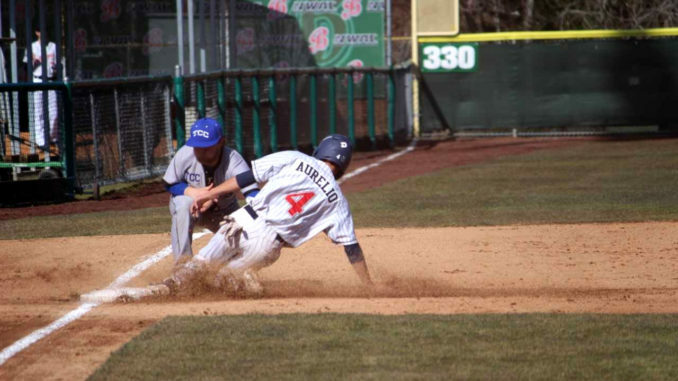 Baseball season is in full swing, and the Bellevue College baseball team is off to a strong start. Their first series was a three-game series against Mt. Hood. Explosive in nature, the bulldogs made a strong showing against Mt. Hood, despite not playing the second and third games of the series. Despite being behind 3-1 going into the sixth inning, Bellevue eventually took the game 6-4. The star Bulldog this game was without a doubt shortstop Riley Parker. Parker went 3-4 with two solo home runs in the third and seventh innings. Dylan Ames and Dac Archer both homered this game, and a Riley Gill sacrifice fly broke the 4-4 tie in the ninth inning. After two game cancellations, Bellevue’s next series was a four-game series against Pierce. Outside of a two-run home run by Ethan Smith, Bellevue went scoreless in a 4-2 loss in game 1. Looking to bounce back, Bellevue answered strong in game two, scoring seven unanswered runs in the first two innings. It was hit after hit as Ethan Smith, Kyle Seitz, Dac Archer and Dominic Martinez all hit for run-batted-ins in this span. That was all the space Bellevue needed to power through a 9-4 win. Game three was a nail-biter as Bellevue entered the eighth inning down 2-0 before answering back. Three singles loaded the bases before a sacrifice fly by Riley Parker scored the first run and advanced a runner to third base. Carter Wallace attempted to steal second but was thrown out, although it gave time for Ethan Smith to score from third. An RBI from Jake Terao was enough to close out the inning and set the final 3-2 score, just in time to win the game. Game four of the series resembled both the previous games in different ways. Heading into the sixth inning, Bellevue was down 1-0, but the floodgates would soon open. The four-run sixth inning was capped by a three-run home run by Dylan Ames. The seventh inning saw four runs, highlighted by a two-run single from Garrett Gants. The eighth inning saw three more runs hit by Nick Hovland, Mack Mahovlich and Jake Terao. The Bulldogs took the game, scoring 11 runs on 12 hits and took the series against Pierce 3-1. The most recent series played was a four-game set against Tacoma. Even after the series, Tacoma boasts an 11-1 record, with their one loss being against Bellevue in these games. After a brutal 9-2 loss to start the series, they nearly bounced back in game two. A nine-run sixth inning put Tacoma up 12-3 going into the eighth, where the Bulldogs did their best to bring it back. Jake Terao hit a three-run home run to cap off the four-run inning as the game went into the ninth. The bases were loaded when a sacrifice fly hit by Riley Parker scored the first run of the inning. A fielding error by Tacoma and a wild pitch scored two more, and Al Aurelio hit a two-run single before the game ended 16-11. After another rough 2-1 loss, Bellevue set out to avoid the sweep by Tacoma in game four. Three of Bellevue’s four runs came in the seventh inning, highlighted by a solo homer by Jake Terao. After the Bulldogs loaded the bases again, a fielding error allowed two more runs to come through. That put the cap on the game as Bellevue would take it 4-2. Currently, Bellevue stands at fourth in the North Region. In-conference play hasn’t even started yet but their 5-4 overall record is just half a game behind Olympic for third place. The Bulldogs have a four-game series against the 3-5 Lane to look forward to, as well as dual two-game series’ against the 0-8 Walla Walla and the 2-2 Columbia Basin.